The Kickstarter campaign for Shadowrun: Hong Kong, teased by developer Harebrained Schemes over the holidays, is now underway. HBS co-founder Jordan Weisman said the new destination was an easy choice, since it lost out by just a hair's breadth to Berlin as the setting for Shadowrun: Dragonfall. It's also a very "different, dynamic place," with unique creatures, supernatural elements and other gameplay components that will set it apart from the previous games. One of the most notable changes being made for Shadowrun: Hong Kong is the implementation of "wild magic," something Harebrained said will "dramatically change the gameplay, with some unexpected results" for players who wield magic while standing on ley lines—confluences of great power that, in the previous games, increased spell accuracy and damage, while decreasing cooldown times. 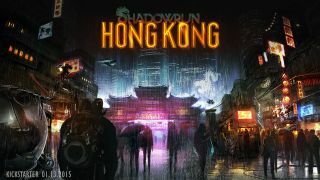 Shadowrun: Hong Kong will also incorporate the concept of "guanxi," the player's network of influence, relationships, and "face," which Harebrained co-founder Mitch Gitelman described as "basically a meter of your reputation. Reputation is very important here, and we're going to be modeling that as well." He also emphasized that increased effort is being put into the storytelling and role-playing aspects of Shadowrun: Hong Kong over its predecessors. Dragonfall was a big improvement on Shadowrun Returns in that regard, and he said the new game will take it even further: The studio is focused on making it even less linear, and on opening the world up to exploration earlier in the game. "Shadowrun Returns was a combination of building the engine, the tools, and the game. It was our first outing with our toolset," Weisman said. "I think the audience saw and appreciated the big step between Shadowrun Returns and Dragonfall, and then Dragonfall Director's Cut, and the process of maturing into our own toolset, and really how to tell stories with all these tools we've created. And now what we're excited about is being able to take advantage of everything we've learned in Dragonfall and raise the bar one more time." Unlike the previous games, Shadowrun: Hong Kong is not being made for tablets. That will allow the developers to take more advantage of the power of PCs than prior efforts, and while Harebrained is "not targeting Dragon Age," as Weisman put it, we can expect a better-looking game. Unfortunately for players attached to their Berlin crews, importing characters from Dragonfall isn't going to be possible: Each game in the series is designed to be a self-contained experience, and even with the difficulty turned up, bringing in a seasoned crew from Dragonfall would throw things wildly out of whack. Hong Kong will include a full-featured editor, however, giving players access to the same tools and resources, including new characters and tilesets, used by the developers. As much as the game has changed, so has the Kickstarter campaign. Shadowrun: Returns was funded entirely by fans, but this time the studio is funding the development on its own, and in fact Shadowrun: Hong Kong is already well into development. The Kickstarter campaign is essentially all stretch goals, although Gitelman said the studio isn't thinking of them as stretch goals so much as just "more stuff." Pledging works the same way as usual, with various tiers and attendant rewards, but the more the Kickstarter exceeds its base goal of $100,000, the more the base game will be expanded. "What we're going to Kickstarter with is a collection of things which are outside the scope of our budget, that we think would be very cool to add, and if players do too, and back us, then we'll be adding additional features to the game. The game that we're currently budgeted for is about 12 hours and will have the same quality of gameplay and storytelling you saw in Dragonfall Director's Cut, but with this very unique Hong Kong flavour and a brand new story, brand new runners, and so on," Weisman said. "Depending on which additional features are added via the Kickstarter, the total length of the game could hit about 20 hours." "We're making this game. We're passionately making this game. We've got a story we really want to tell, and the reason we're going to Kickstarter is just so we can do 'bigger and more'," Gitelman added. "More personal missions, we want to add in-game animatics to increase our storytelling repertoire, we have increased crewmembers that can be unlocked through Kickstarter – people reacted really positively to the crew that you got in Dragonfall, and we're going to be doing even more of that and making them really interesting, with motivations that may not always sync up." The Shadowrun: Hong Kong Kickstarter is live now and runs until February 17. The game itself is expected to be ready for release by mid-2015.